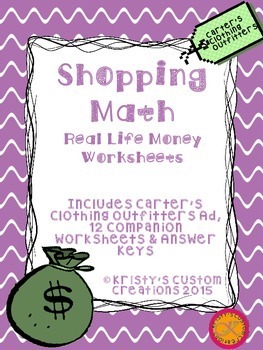 Provide your students with real life experience using money. 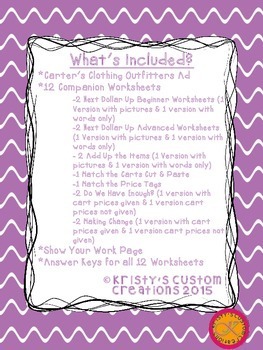 This product includes 12 worksheets that go with the included Carter's Clothing Outfitters Shopping Ad. Some worksheets are different versions of the same worksheet(beginner, advanced) which are perfect for differentiating for your students who may be on different levels. See the what's included section below for more details. 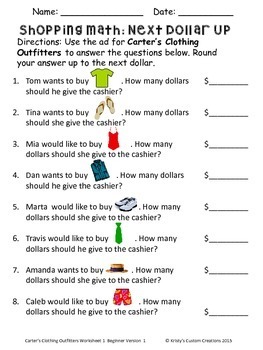 Skills included in this product include: reading an ad, next dollar up, adding up prices, determining how much money is needed to make a purchase and making change. Please download the preview prior to your purchase.